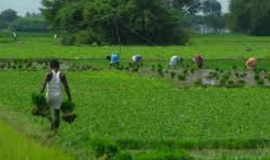 COIMBATORE: Government is coming out with a special insurance cover for the benefit of agriculture sector, a top United India Insurance Company official said today. A Uniform Package Policy is being worked out for the benefit of farmers, which will cover crop, personal accident, health and agricultural implements, Chairman and Managing Director of United India Insurance Milind Kharat told reporters here. The insurance companies are in discussion with the agricultural ministry with regard to formulating the policy, which would be finalised in a few days, Kharat said. His company will shortly introduce an exclusive insurance product for the benefit of SME sector, Kharat said. “Instead of having separate insurance schemes for different things, like building, machinery, the risk cover will be in one package, which would benefit the sector, depending on the requirements,” he said. Kharat was here to inaugurate a community hall as part of its Corporation Social responsibility in association with Rotary Central of Coimbatore at Kudanoor tribal village in Anaikatti on the outskirts. Asked about Government Insurance companies Third Party Administrator (TPA), the official said four insurance companies have already got approval from IRDA. The pilot project has been launched in Delhi and a full-fledged administrator will start functioning from April one next year, he said. To a question on company’s performance, Kharat said it was growing at the rate of 11 per cent as against the general average of 10 per cent and expected the trend to continue during the coming years.